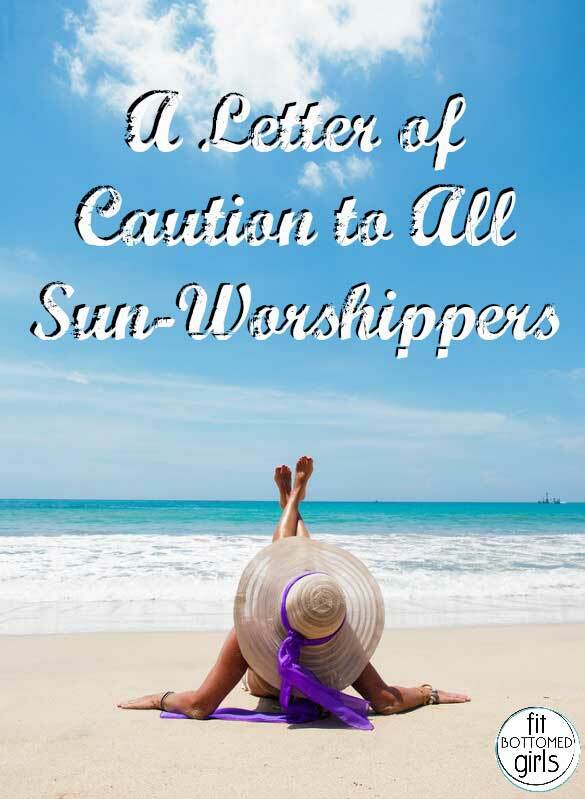 A Letter of Caution to Sun-Worshippers: Dark, Golden and Now Blotchy! A Letter of Caution to All Sun-Worshippers: Dark, Golden and Now Blotchy! Back in the day, nobody used sunscreen. From the concrete ponds of California, to the lakes of the Midwest, to the beaches of Florida, us sun worshipers actually went for what we called “the burn.” It was practically a rite of summer and a small enough sacrifice to achieve that dark golden bronze we all so desired. The indignity of that first disrobing, when God and everyone else at the pool chuckled at our lily-white bodies, was soon forgotten once we got some red on that skin. Every weekend, from 10 a.m. to 2 p.m. (the prime tanning hours), we baked and basked until we could take no more. Girls and guys alike slathered up with everything from iodine and baby oil to the highly coveted Panama Jack Dark Tanning Oil with zero SPF and exotic tropical fragrance. How else were we to attain that deep, long-lasting tan? And I am here as living proof to say that deep and long-lasting part—well, they weren’t kidding. Years of sun exposure have put the kibosh on my dermis that no fancy lotion or cream will ever repair. Brown spots, new moles and red patches show up daily! Long gone are the days of throwing on a bit of mascara and walking out the door. I now spend my hard-earned cash on the best products available to help conceal the sun’s damage and wouldn’t dream of leaving the house without some form of make-up. Did I mention the sun-seeker bonus? Overexposure to ultraviolet rays cause an accelerated collagen breakdown resulting in looser, saggier skin! I am sooo glad I could give gravity a helping hand! A few naturally occurring wrinkles are one thing, but mottled, leathery skin caused by cellular damage is completely avoidable. You lift weights to keep your muscles toned and exercise your heart and lungs on a daily basis; don’t ignore the largest organ of the human body and skip the sunscreen. You will most definitely regret it. You know you’ve lived through more than just a few summers when you start using phrases like “back in the day.” Eventually you younger gals will have to deal with spider veins and dry, crepe-like skin, so do yourself a favor: don’t add sun damage to the mix. Trust me, Mother Nature doesn’t need your help. Let’s not forget the main reason for using Sunscreen- SKIN CANCER! At 25 I was diagnosed with Melanoma, this is no joke ladies. And as for SPF I am extremely diligent about using it, and will only use SPF 30 +, normally 50. And yes ever since I was diagnosed with Skin Cancer I became much more wary of my sunscreen rituals, but I do still enjoy the sun, because of its benefits, and it makes me happy, just have to be smart about it! Great reminder of sun damage to the skin. As a woman of color, it’s hard to find a sunscreen that doesn’t make the skin appear caked with a layer of white but it’s important to find one and use it. Skin is skin, it’s as fragile and resilient on every skin color of the rainbow. It amazes me that people DON’T wear sunscreen on a daily basis. I’m Cuban and Italian and I think I’ve had exactly one sunburn my entire life but I wear sunscreen (a dermatologist recommended brand with zinc in it) on my face daily. I can see a marked difference from what I use on my face to what I use on my body at the beach since it’s a cheaper, mass-marketed brand. The sun is strong and damaging and I think the number one “beauty product” or anti-aging cream is sunscreen! I am that super-crazy mom that is always calling her kids back to re-apply their sunscreen. My youngest is 5, but he already knows to ask if I can put some sunscreen on him because he wants to go play outside! I wear it year-round, even though I live in the Seattle area. My moisturizer and foundation both have SPF (and the moisturizer goes on my neck and chest as well) for year-round coverage, and I break out the sunblock for my arms, legs etc if I’m not all covered up with clothes. I’m only 35 and I already can see evidence of sun damage on some of my sun-worshiping friends. Also, my aunt has had several procedures to remove cancerous spots on her face. no fun! I think you should reconsider this – the skin is incredibly absorbtive. What we put on the skin goes into our bodies, into our blood, affects our toxicity and immunity. Sunscreens are full of toxic petrochemicals and additives. Add in the heat of the sun, and we soak them up. Not good. Two things: The skin adapts just like the rest of our physical systems. If you start with a reasonable dose and increase slowly without sunscreen, you’ll tan instead of burning. That is a good thing. Tan is healthy. Burn is not. Recognize the distinction. Second: If you must spend more time in the sun than you can handle without sunscreen (or are one of the small percentage who really never adapt by tanning), choose a non-toxic sunscreen. Remember: what you put on your skin gets soaked up. Choose wisely, and go natural (sans-sunscreen) when you can. I personally use SPF50+ on my face every day (lotion, moisturiser, suncream, foundation, powder… that’s the routine) and SPF30+ on any remaining skin. I have been diligent about my face for a few years, but not as diligent about the rest during winter. In Australia, it is impossible to get anything more than 30+… don’t even start me on how ridiculous that is though. Instead I have to stock up on it whenever I go overseas! To read the above poster say that tanning is healthy makes me feel sick. There is nothing healthy about a tan, it is a form of damage to your skin and does cause skin cancer. There are certainly questions about the content of sunscreens, but I have to say that the higher likelihood of getting skin cancer makes me more than happy to soak in the stuff. Sunscreen is SO important, but so is making sure the ingredients in your sunscreen don’t cause the very thing you are trying to prevent!! Many sunscreens out there contain carcinogens, yep ingredients linked to causing cancer. Become educated and carefully read the ingredient labels on all your personal and home care products. There are great companies out there providing safe products, but don’t be fooled by all the others with their marketing claims of green, pure, organic, natural, safe, lab tested, doctor approved. Personally I use (and LOVE) products from Ava Anderson Non Toxic. The sunscreen works great for me and I have the “always burns” kind of complexion. Their sun protection products have gotten the highest ranking from EWG and other experts for being safe and effective. Check it out!! I am a fabulous woman in her 50’s, but because of all my Sun exposure, I cannot leave my home without make-up. I have these hideous brown marks on my skin, and no matter how expensive my skin cream is, they are still there. I do try to cover them, but they always find a way to peak through my make-up by mid day. Please use sunscreen, your skin will thank you for it!! !